- Select Components => Jom Classifieds => Adverts => New. - Now fill up the form as per following instructions. Title Title for your advert..
Category Category in which the advert should be listed.Note : If the selected category has any custom fields, then those fields will get listed below this categories selectlist. Description Text area to describe your advert. Created by By Default, it will be set as "admin". 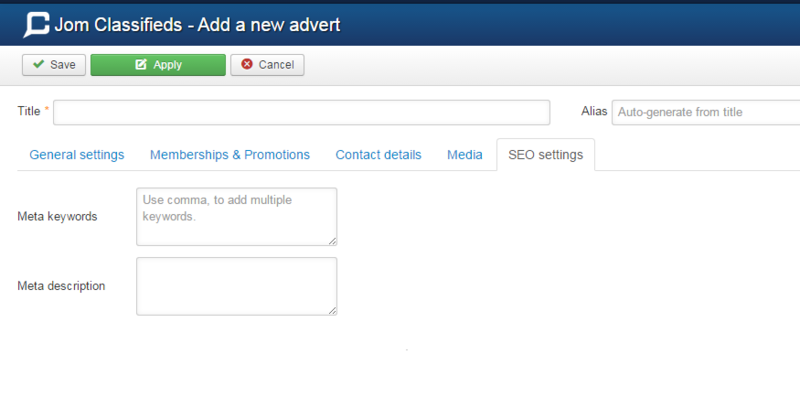 If you require , you can select some other user to post it under their adverts listing. Published Select Yes/ No, to whether publish your advert or not. Price Enter cost for the advert. IP (IP address) Stores the advert owner IP address for safety precautions. Membership type Select membership under which the ad must be posted. Expiry Date Expiry date will be set automatically, when a membership is selected. If required, admin can change it manually. 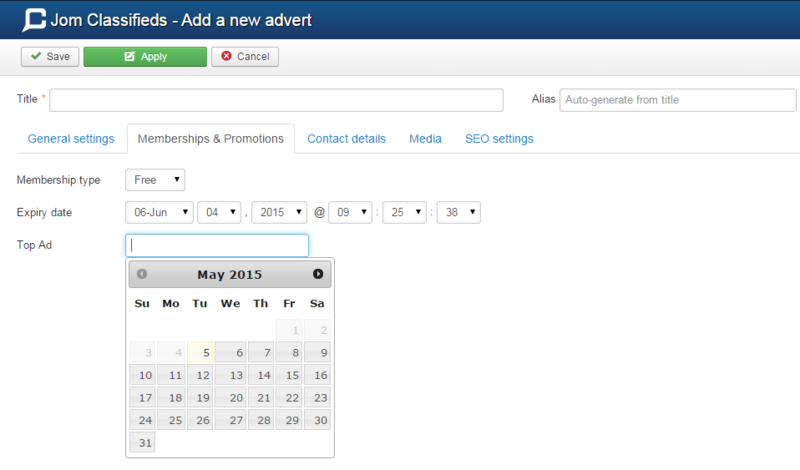 Promotion(topad) Set the date, till which date it should be displayed in top. Address Add your Advert or Business location. Country Select the country in where your business is located.. Region Select the particular region in where your business is located.. Phone number Add your phone number. So, that the users can contact you regarding your advert. Postal Code Add the exact postal code of your advert location.Note : Our map section automatically get updated according to your input or selection in address, country, region & postal code fields. You can also use the marker inside the map and point the exact location if possible. YouTube video If you have any YouTube video related to the advert which you are posting, then add your "YouTube video page url" here to promote your product in more better way. Images Upload images for your advert using the upload button. Meta - keywords Add custom Meta Keywords to your advert page (Use comma to separate multiple meta keywords). Meta - description Add custom Meta Description to your advert page..
- That's it. Save the form. You have successfully added a advert.